Exact pathophysiological mechanisms of bipolar disorder have not been sufficiently clarified. We review the evidence of mitochondrial dysfunctions on the relation between both disease and pharmacotherapy. Mitochondria produce the most of energy-rich molecules of adenosine triphosphate (ATP), apart from energy production they are involved in other functions: regulation of free radicals, antioxidant defenses, lipid peroxidation, calcium metabolism and participate in the intrinsic pathway of apoptosis. 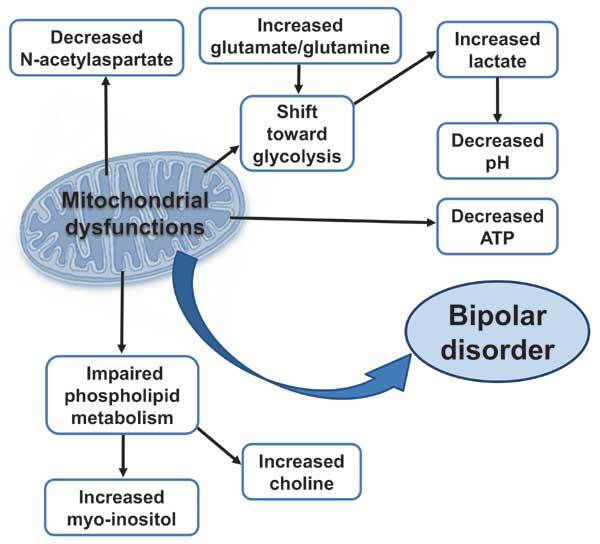 According to increasing evidence dysfunctions of mitochondria are associated with affective disorders, a hypothesis of impaired mitochondrial functions has been proposed in bipolar disorder pathogenesis. Mitochondrial DNA mutations and/or polymorphisms, impaired phospholipid metabolism and glycolytic shift, decrease in ATP production, increased oxidative stress and changes of intracellular calcium are concerned in mood disorders and effects of mood stabilizers. Recent studies have also provided data about the positive effects of chronic treatment by mood stabilizers on mitochondrial functions. Bioenergetics, bipolar disorder, electron transport chain complexes, mitochondria, mitochondrial DNA, mood stabilizers, oxidative phosphorylation.